When Stuart and I first decided to get m…owed, I mean married, we looked at all the options. At first, things looked very discouraging and overwhelming, but now that we’re on the other side of things, in hindsight, it wasn’t all that bad. Of course, we thought about marriage in the US. From what I could tell, he would have needed a K1 Fiance Visa, a process that would have taken about 6 months. That amount of time did not appeal to either of us. Besides, I would have had to sponsor him financially, and that wasn’t happening. We looked into marriage by proxy, but that seemed to be available only to the military unless I wanted to fly to another state where it is legal. However, not every country recognizes marriages by proxy, so this wouldn’t have helped us anyway. Next, we looked at France. In fact, for a few weeks, we thought this was our best option because I could just go on an application-free Schengen Visa. The problem with marrying in France came down to the paperwork. Everything, passports, birth certificates, divorce decrees, etc., would have to be translated in order to get married. Then everything French would have to be translated to English for use in the US and UK. The language barrier made this a poor choice. Frustrated, we began to look at the UK. They offer something called a Visitor for Marriage Visa. It seemed like our best bet. With this Visa, I could enter the UK for the purpose of marriage for a period of up to 6 months, and the applications were only taking about 4-6 weeks. To top it off, Stuart’s cousin is the registrar of the town where we wanted to marry. She could marry us! 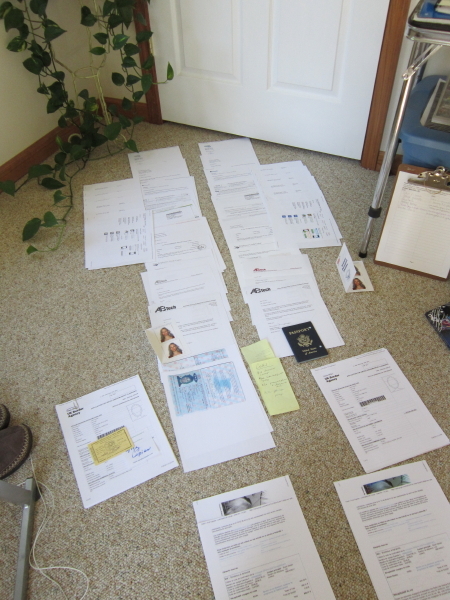 My visa application about halfway complete. Some of these things were tricky. Our Skype transcripts were nearly 500 pages long, so I needed to abbreviate them down to something manageable. Many documents needed to be originals. There were also time constraints and many agencies and people with their own priorities and timelines involved. Since I had scheduled my biometrics appointment two weeks after my application online, I then had to have everything ready to be submitted by the deadline two weeks after that. There were some moments of hair-pulling as we waited for things or discovered new things we needed to include as the deadline drew closer. The whole time, I kept feeling very sorry for people who aren’t as logistically minded as myself, let alone non-English speakers, starting this process only to find they’ve missed a piece or a deadline. Then I went about making copies (there had to be two of everything), indexed it all with a cover letter, and shipped, being sure to include the required return postage and packaging. I also scanned the whole thing, so I would have digital copies. I got a little nervous when UPS said they wouldn’t insure my passport, but what could I do? I had to trust and send it. UK Immigration was great about communicating through emails throughout the whole nail-biting process. Within 6 weeks, we had approval! Just in time to buy a plane ticket in advance of our selected wedding date. If it’s true that what doesn’t kill you makes you stronger, the visa process certainly built up our muscles. Good thing, because as an international couple, there will be lots more paperwork ahead!